Looks so good...The cupcake too ! This is beautiful!! LOVING the bright happy colors and love love love the cupcakes!!!!!!! Sounds delicious! Like the blocked background all the cooking themed pieces. Happy Friday! ooo How fun and happy is this page. Just as yummy as the nutella. That looks delicious! Gorgeous page. Such a great page, Lisa! I need some embellishing tips from you, you do it so well!! Those look delicious! What a fun page! I just love all the little bits of this layout! Awesome job as always! We just discovered Nutella! Absolutely yummy! Glorious. So bright. They go so well together. Yummy! Gotta try out that recipe. Those are some yummy looking cupcakes. Love all the color on this page! Great layout!! I love how well those two lines work together. Thanks for sharing, and thanks for visiting my blog. YUMMY!!! Looks amazing! 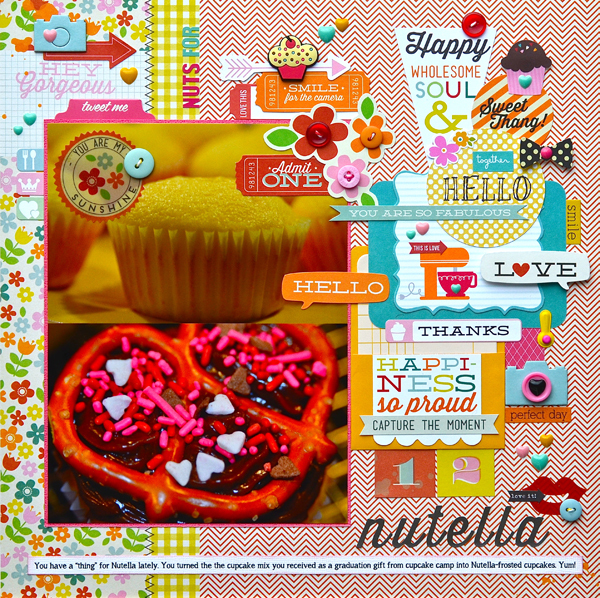 The layout and the cupcakes! I really am interested in that recipe! I ADORE Nutella like it's nobody's business! Lol! Super sweet and happy! Love it! Yumm!! And love how you documented this! Fun and happy! of course you did. How many ways did you document? tasting too :):) Adorable fun event!! You have really rocked this Pink Paislee collection. Super cute. Such a fun page.